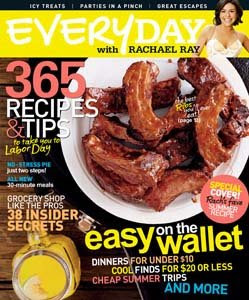 When you look at this month's cover of Every Day with Rachael Ray - what is your first thought? Mine was, "mmmm, those ribs look good." Apparently more observant people over at Brandweek realized that this was the first time that the cover featured something other than Rachael herself for the first time since 2004. Although, mini-Rach is still up in the corner, so she's not entirely missing from the cover. Don't worry, Rachael will be back on the cover in September and October. So what's up with this issue of the magazine? My favorite 30 Minute Meals section has Sicilian Tuna Cutlets with Orange-and-Scallion Salsa, Almond-Herb Pesto Pasta with Artichoke and Tomato, Tex-Mex Buttermilk Chicken Tenders and Corn on the Cob, Puttanesca P'schetti with Shrimp, Curry Crunch Salad with Naan, Pork Chops with Honey-Mustard Gravy and Apple Slaw, Moroccan Skillet Chicken with Pine Nut Couscous, End of Summer Chili Pot, Who Ya Callin' Chicken? Stuffed Sammie Pockets, and End of Summer Penne alla Norma. Um, I am pretty sure I will be trying almost all of those (I think I'll skip the tuna cutlets and the puttanesca). After the 30 Minute Meals section, I always have to check out the Weekly Menu Planner. This month is a good one: Pan Fried Chicken with Fresh Tomato-and-Corn Salsa, Spinach Salad with Grilled Ham and Peaches, Grilled Pork Chops with Plum-Ginger Sauce, Grilled Ratatouille, Grilled Philly Cheesesteak Tacos, Grilled Halibut Kebabs with Tarragon Butter, and Summer Herb Spaghetti with Crumbled Bacon. Mini Caesar Salad Pizzas, Tuna Melt Chips, Chicken Salad Piccata, Bacon-and-Egg Club Sandwiches, and Grilled Pork Meatballs with Pineapple-Chipotle Chutney. Make sure you check out this issue's travel section, where Rachael shares the recipes from her SXSW party and shares her favorite spots in Austin. This is my least favorite cover:) I gotta have my monthly cute RR pic! !